Here's a post from December 2013 that is more relevant today than ever. 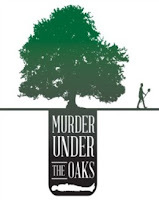 I'll be discussing Dashiell Hammett with Julie M. Rivett and Richard Layman at Bouchercon 2015 in Raleigh, N.C., next month in a session called "Inside the Mind and Work of Dashiell Hammett." The Bouchercon schedule calls it a special event, and I agree. Hammett was the best ever, and Julie and Rick know more about him than just about anyone else. See you there; the fun starts at 8:30 a.m., Saturday, Oct. 10. Julie M. Rivett, co-editor of The Hunter and Other Stories, the new volume of previously uncollected and unpublished work by Dashiell Hammett, drove up from Orange County to chat with Detectives Beyond Borders about the book, Hammett, the movie interpretations of his work, his critical reception at home and abroad, and other subjects—including some of her favorites among current crime writers. Rivett is not just a Hammett scholar and researcher, she's also the daughter of Hammett's daughter Jo (she met her grandfather once, when she was 3 years old) and, she says, "What I want to come from this is that people will read [Hammett's work] as literature. I want to make him a rounder character." Your humble blogkeeper says the book, co-edited with the noted Hammett biographer and scholar Richard Layman, will do just that, especially in the form of "The Secret Emperor." Rivett says the combination of her personal contacts and Layman's professional ones strengthens their partnership. (They also worked together on Return of the Thin Man, which brought together two previously unpublished stories about Nick and Nora Charles.) And, asked about the portrayals of Hammett as a communist, a drunk, or a bad family man, Rivett rebuts some of the stories, concedes others, and says: "It's always a difficult thing for me when people co-opt my actual grandfather." Her list of favorite contemporary crime writers includes Declan Hughes, Dennis Lehane, Michael Koryta, and George Pelecanos, and if I were a crime writer favored by a descendant and scholar of the greatest of all crime writers, my sinews would come unstrung and my tongue would cleave to the roof of my mouth for a few minutes before I was able to resume writing. Coming soon: Rivett on Hammett's reception in France and Italy, and the possibility of more Hammett material to come. 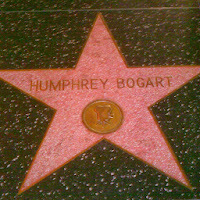 Rivett and I met for tea and a wine chaser at the Musso & Frank Grill on Hollywood Boulevard, close to stars on the Walk of Fame that honor several figures prominently connected with Hammett's life, career, and interests. 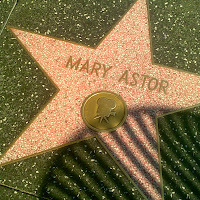 Mary Astor's, Myrna Loy's, and Fatty Arbuckle's stars are within a block and a half of the restaurant, and later I found Peter Lorre's and also the one that honors some guy named Bogart. Lorre and Sydney Greenstreet were perfect for their roles in John Huston's celebrated film version of The Maltese Falcon, Rivett said, and Bogart, she added, while not physically perfect for the role, did marvelous things with the character. Bogart not perfect. Fair enough. Now, though, just try reading TMF without seeing the actors rather than the characters in your mind's eye. Musso and Frank. Great choice. Don't miss having lunch at the Farmer's Market. It is a true spectacle event! Like many Hammett readers, I saw the movie version of The Maltese Falcon before I read the book. I suspect I was not the only one surprised by Hammett's description of Sam Spade as a pleasantly blond Satan. I also smiled at RIvett's description of Bogart as a little short for the role. That reminded me of Carmen Sternwood's remark to Philip Marlowein (Chandler's) The Big Sleep that "You're not very tall, are you?" and Marlowe's reply that "I try to be." I asked Rivett that very question, whether she sees the actors as she reads. She says she hears their voices rather than seeing their faces. I like all the crit-lit by Richard Laymon, George Thompson, and others as well. "Unlike the traditional detective story in which crime is portrayed as a temporary aberration in an otherwise orderly universe and in which the detective's actions are shown to restore his society to health, the Hammett novels render an extremely ambiguous moral vision. Spade is defending civilization, yet at the same time detesting the always corrupting influence of that same civilization. Everyone turns out to be masked as to their real intentions, and Spade is knowingly bemused every time. As when Miss Wonderly/Leblanc/O'Shaughnessy confesses that her story was just a story. "Oh, that," Spade said lightly, "we didn't exactly believe your story...we believed your two-hundred dollars." Thompson and Layman are two of the more renowned Hammett critics and scholars. Yep, and Spade, the Continental Op, and the Op's boss never get angry. Why would they? They just to what they have to do in a world where everyone simply acts according to his or her own nature or character. Peter, this last comment (at least it was last when I started typing this) describes why Hammett is so great, in my mind. His stories and characters follow an analogous rule to Elmore Leonard's use of humor: everything is organic. They do what they do and say what they say because that's who they are. This allows everything to make sense and feel satisfying. Dana, I have read the scene in The Maltese Falcon in which Spade goes to Sid Wise's office to find out what Iva Archer had told him. Wise balks, says that if he had one more client like Spade, "I'd be in a sanitarium--or San Quentin." "You'd be with most of your clients," Spade replies, and he then has Wise answer the question and reveal a major plot point in the process. It is a beautiful set up, obviously well thought out, yet appearing casual. It's a beautiful little piece of writing. I love that scene. Another favorite of mine is the oft-recited, "We didn't believe your story. We believed your $200." That. combined with the ending, shows more about Spade's character than ten pages of exposition. He's in it for the money, and will look away for enough money, but only so far. Yep, I quoted the $200 line in one of the posts I made around the time I talked with Julie Rivett. By the way, as good as the Bogart/Astor/Lorre/Greenstreet movie was, it improved on the book's dialogue in just one line. That line also involved money. Do you remember what line it was? (You may quote either the movie of the book." Your provocations are sufficient to send me back to another reading of TMF. Ain't provocations like yours just what good book blogging is all about! I even plan on resuscitating "Crimes in the Library" with my (re)reading and critique of TMF; I have been lazy there, but the future bodes well, especially with TMF as the catalyst. I hope you will tune-in at "CITL" when those critiques begin appearing soon. Again, thanks for sending me back to Hammett, Spade, Brigid, Cairo, Gutman, et al. I'm telling you: Each time I read The Maltese Falcon, I notice little things Hammett did that I had not noticed before. Among these are nice little pieces of foreshadowing in the scenes where Gutman offers Spade a drink, and the frequent descriptions of Spade's yellowish eyes. Like any great work, that is, it remains constantly new.